Easily get your thoughts across and share bright ideas with a splash of colour. The Marks-A-Lot® Dry Erase Marker set features four colours with broad chisel tips to let you write in a variety of thin or bold line widths without having to change pens. Bright, colourful ink will catch your viewers' eyes and will easy wipe away from whiteboards, mirrors and other nonporous surfaces with the sweep of an eraser or dry cloth. Easily get your thoughts across and share bright ideas with a splash of colour. The Marks-A-Lot® Dry Erase Marker set features four colours with broad chisel tips to let you write in a variety of thin or bold line widths without having to change pens. Bright, colourful ink will catch your viewers' eyes and will easy wipe away from whiteboards, mirrors and other nonporous surfaces with the sweep of an eraser or dry cloth. Wield the dry-erase markers confidently while the multi-faceted cap sits securely in the bottom. The non-toxic, low-odour, certified formula makes the dry-erase markers safe for use at work, at home, or at school so you can communicate loud and clear, anywhere. 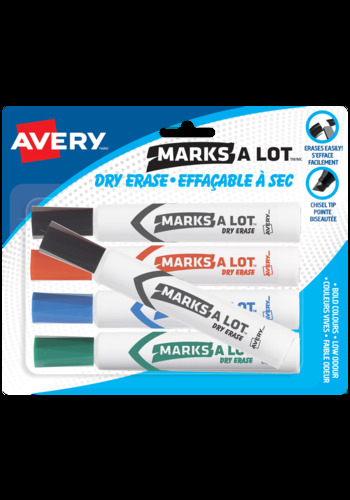 Avery Marks-A-Lot Dry Erase Markers are non-toxic and ACMI certified. A must-have for students and professionals, perfect for home, office or school. Thin or thick, angled or straight. The Marks-A-Lot Dry Erase Chiseled Tip gives you many creative ways to write-out important phrases, words, or information without having to switch markers. Perfect to write messages on whiteboards to family members, reminders for appointments. Use on other non-porous items like whiteboards, windows, mirrors, appliances and more.